Policeman: ‘This isn’t going to help the planet’. Me, with at least 10 other cameras around filming: ‘His voice is being heard, that’s what matters’. 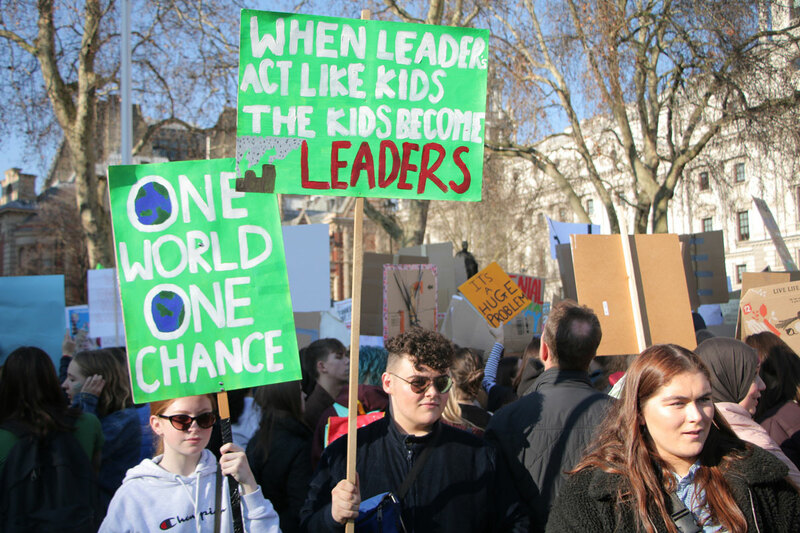 On 15 March students from around the world will join a global Youth Strike for Climate, leaving school and college to demand that their leaders urgently take climate action. 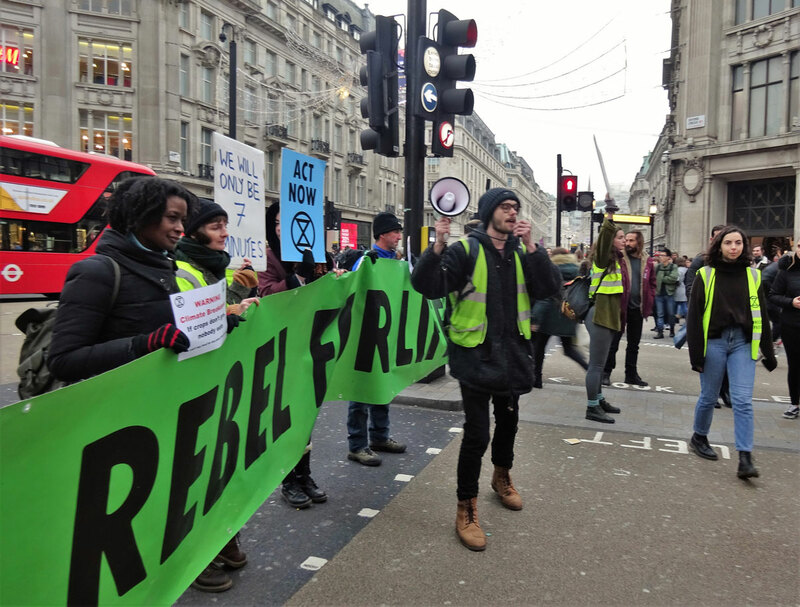 In this guest blog Farhana Yamin, CEO at Track 0 and Extinction Rebellion Activist and Jake Woodier, an organiser of #YouthStrike4Climate explain why. Politicians beware. Young people are demanding answers from governments to some tough questions. Why have scientific warnings about the climate and ecological crisis been ignored for so long? What emergency actions can now be put in place to stop the extinction of life on Earth? Tired of the apathy and denialist campaigns funded by vested interests, young people are taking to the streets and joining new social movements that are demanding solutions be put in place in 10 years or less. That timeframe more or less matches the 12 year deadline given by the United Nation’s chief scientific body, the Intergovernmental Panel on Climate Change (IPCC). In October 2018, the IPCC spelt out the consequences of what a hotter more disruptive climate would look like. Unless we cut global greenhouse gases emissions by 50% in the next 11 years, billions of people would be exposed to increased storms, wildfires, droughts, floods, acidified oceans and sea level rise which would result in water and food shortages and mass migration. Fearing for their future and acting out of solidarity with their fellow global citizens, this week hundreds of thousands of young people are expected to walk out of schools and colleges to join the school strike movement. They are inspired by 16 year old Greta Thunberg, who in August 2018 stopped going to school on Fridays to sit outside the Swedish Parliament and demand climate action. Since then, thousands of young people around the world have joined the Youth Strike 4 Climate movement with campaigns now active in around 71 countries. In Belgium, around 50,000 children and young people take to the streets every Friday. The UK’s student movement is gathering momentum. The first national strike resulted in 15,000 students and young people ditching classrooms to demonstrate a need for radical and urgent action to achieve climate justice for current and future generations. Long held attitudes of moderation are now woefully insufficient given the global climate emergency we all face. 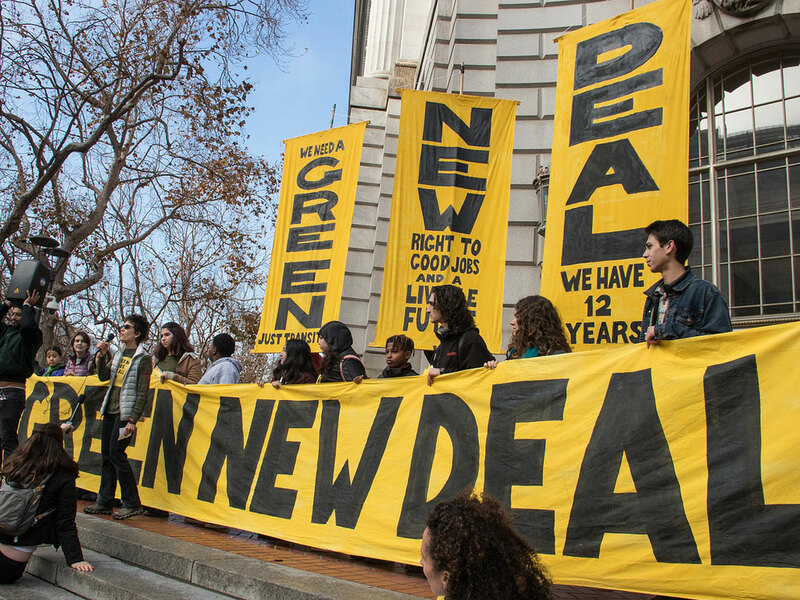 From the “Green New Deal’s 10 year plan to reduce greenhouse gas emissions to zero in ways that generate clean jobs, supported by the youth-led Sunrise movement and championed by Congresswoman Alexandria Ocasio-Cortez, to the Extinction Rebellion’s campaign of mass civil disobedience to dismantle the toxic systems that are putting all life on Earth at risk, it is clear that the desire to build a more inclusive society based on respecting nature’s boundaries is beginning to reshape politics. No-one knows what will happen and no-one can say for sure whether or not fundamental ecological tipping points have already been breached. The good news is that there are millions of people – old and young – who are mobilising around the world to stop humanity from falling off a cliff. We can and must succeed in catalysing a peaceful revolution to end the era of fossil fuels and economic systems based on the extraction and extinction of nature. Life on Earth literally depends on it. That is why we will be supporting students on strike and all those working to defend life on Earth. As citizens around the world join together to courageously speak truth to power, we hope you will give your full support to strikers and rebels where ever you are. Extinction Rebellion Glasgow formed in November 2018, and took our first actions the following month, including disrupting Christmas shopping by swarming in Style Mile shopfronts, and forcing BBC Scotland to close their front doors due to our Reclaim the BBC demonstration. You may have seen XR Scotland’s Rabbie Burns inspired action, in the news recently too, as XR members occupied the Scottish Parliament and conducted the UK’s first ever Citizens Assembly on Burns Day, the 25th of January, with crucial contributions from XR Glasgow members. I don’t actually know any Burns poems to quote to you and find the language archaic but I’m quite a fan of social commentator and poet, Gil Scott-Heron. He famously said “the revolution will not be televised” but I’m beginning to wonder if he was right about that, as News outlets seemed quite keen to broadcast our recent action at the Scottish Parliament. Fun Fact: Gil Scott-Heron’s dad played football for Celtic FC in Scotland and was the first person of colour to do so. You may take our lives, but you’ll never take our treedom! When faced with the destruction of trees and natural habitat, to make way for building developments on Otago Lane close to her home, XR Glasgow member Cheyenne was quick to react and form alliances with a local ‘Save Our Lane’ group. “The main criticism involves the destruction of a vital green area that is home to native wildlife such as otters, kingfishers and bats. The area is part of Glasgow’s Green Corridor and hence should be considered a protected nature conservation area. The initial application stated that trees of a certain maturity and height will not be cut down. However, this was not adhered to”, Cheyenne told me. Glasgow is known affectionately as ‘Dear Green Place’ and wider Scotland fondly referred to as ‘Caledonia’ – the name given to this area by the Romans, due to the vast expanse of woodlands in our region. Sadly we’ve seen our forestry systematically destroyed to a tiny fraction of the size it once was. As the old song by Dougie MacLean goes: ‘Caledonia, you’re everything I’ve ever had’, yet still we destroy her namesake. Come to think of it, ‘Dear Concrete Jungle’ doesn’t have much of a ring to it either. Of course, a hard day of action requires time to reflect and rejuvenate and with XR Glasgow’s new ‘Book/Craft’ gatherings, people are able to come together, talk, listen and conduct vitally important talking and making therapy with one another. “We need to form bonds and care for each other as well as planning actions and creating resources”, group creator, Anna, reflects. “It might also be a focus for people who don’t feel any of the Working Groups are calling to them just now, or are trying to work out how they want to get involved”, she goes on to say, so this event provides a welcoming and inclusive outlet for further discussion. It’s true also, that some of the younger members, along with their families, have found our way of working hard to fit in with the demands of daily life. XR Member Sapna has developed an inspiring initiative to combat this however, with ‘Wee Rebellion’, an event attended by 250 parents and young people. “It’s really difficult for parents, teenagers and children to get to meetings in the evenings but because of the way most people’s work schedules function, it’s the obvious time to have meetings to talk about issues and plan actions. Wee Rebellion will attempt to be a space for parents, children and young people to talk to each other about how they can engage with XR and to generally raise awareness about climate change with the hope of finding shared vision for change. At our first event, among other activities, there will be a discussion space for adults asking what are the barriers to participation for caregivers and what strategies can we collectively come up with to overcome them”, Sapna tells me. Less nuisance, more news sense. Although there are challenges to overcome, fortunately it’s now fairly easy for me to keep abreast of environment news, thanks to the new ‘Glasgow St’ online briefing paper. The brainchild of XR member Thomas, ‘Glasgow St’ has clear principles, which set it apart. Being over-reliant on traditional media for your climate news may not be the wisest decision. With climate lobbyists and business interests attempting to influence the agenda, we must analyse and scrutinise it ourselves. G-Street’s wiki approach allows for a collective learning experience, which I’m sure will prove valuable to the whole XR movement. Users of Medium – take a look and contribute. To keep in touch with XR Glasgow, like us on Facebook, follow @ScotlandXr on Twitter, and @xrscotland on Instagram. Sign up for our mailing list by emailing xrglasgow@gmail.com. From February we will meet weekly on Tuesdays at 7pm at the Kinning Park Complex.